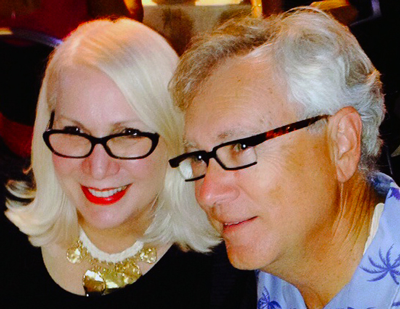 This is the third of seven informal video talks on document review and predictive coding. The first video explained why this is important to the future of the Law. The second talked about ESI Communications. This video talks about the second step of the e-Discovery Team’s eight-step work flow, shown above, Multimodal Search Review. After you understand the initial scope of relevance, you start to use all of the search tools you have, excluding only predictive coding, to create the first round of training documents. This is an exercise in early case assessment where you locate the low hanging fruit, the documents that are easy to find with keyword search, some linear review, similarity searches, including email string searches, and maybe even some concept searches. This is depicted in the first four levels of the search pyramid below. Again, nothing new here. 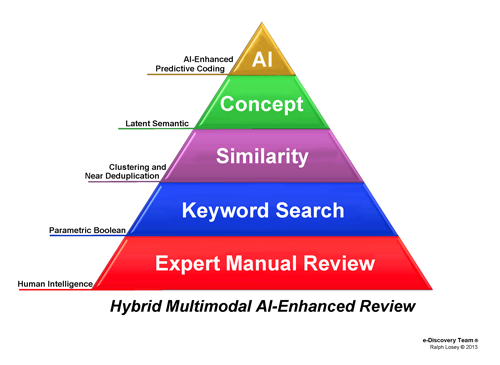 This is done in all review projects, except for the truly archaic ones that only use linear review, the expert manual review at the base of the search pyramid. 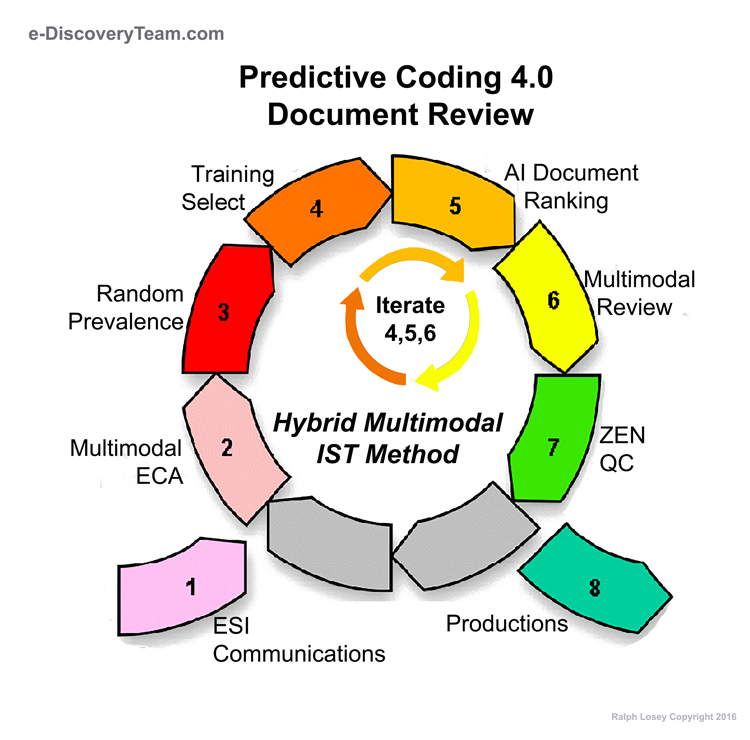 Before you can begin the predictive coding steps four and six, you have to find some relevant documents using other types of search. The relevant documents found in step two are then used to begin to teach the machine in step four. You do not need to find any particular minimum number of documents for the training to begin. Just go for what is easy to find. In the process you start to get a better understanding of the custodians, their data and relevance. That is what early case assessment is all about. 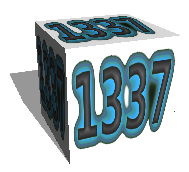 You will find the rest of the still hidden relevant documents in the iterated rounds of machine training and other searches that follow. You can continue using multiple forms of search in the following iterated rounds as the AI training evolves. Step Five is essentially a repeat of Step Two, except that in Step Five you can also use document ranking created in Step Four as an additional type of search. That will be covered in later videos in this series. 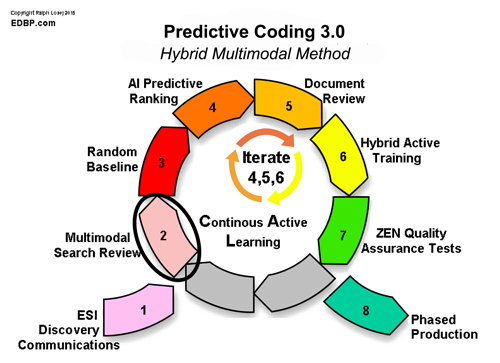 For details on all eight steps see Predictive Coding 3.0. More information on document review and predictive coding can be found in the fifty-six articles published here. This entry was posted on Tuesday, March 8th, 2016 at 11:51 am and is filed under Lawyers Duties, Review, Search, Technology, VENDORS. You can follow any responses to this entry through the RSS 2.0 feed. Both comments and pings are currently closed.